Whether you are looking to grind soft white wheat berries or hard red winter wheat berries, you'll be able to create nutritious flour for pancakes, pizza dough, whole wheat bread loaves and cakes and any other low- or high-rising baked good with a hand operated grain mill. The Victorio uses a mounting clamp to attach to surfaces that are a 1/2 inch to 2 inches thick. It can hold up to 4 1/2 cups of cream at the time, comes with a two-year warranty, it can also be converted to an electric-powered grain mill with the purchase of an optional motor. The 21 lb Country Living grain mill is made of cast aircraft aluminum and has industrial sealed bearings, so you can be assured that is virtually indestructible- it also comes with a lifetime warranty with FDA approved food-grade powder coating. Users say that if you are serious about grinding wheat, you shouldn't purchase anything else- you'll either get discouraged or eventually purchase it after quitting from an inferior unit. That said, it will require permanent installation, and if you do not purchase the motorized kit (be forewarned: it doesn't come with a base), this grain mill will put you through quite a workout. One user describes turning 3 cups of wheat kernels into 5 cups of flour in around 20 minutes of grinding shared between him and his family members. All that said, you will have to do your research prior to purchase to ensure that you select the best hand-operated grain mill for your particular kitchen set up-the Country Living option is more rugged and powerful, but it is a considered purchase. Let's take a look at five of the best-selling hand-powered grain mills on the market today and see how they compare. 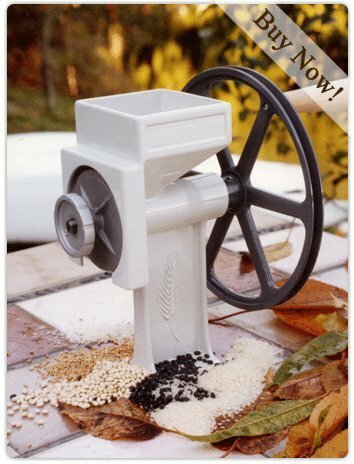 The durable, 3lb hand operated grain mill from Victorio is a good option that is backed by a two-year warranty. Its users love that it is great at quietly grinding grains, but also note that the mounting clamp doesn’t clamp very tightly. 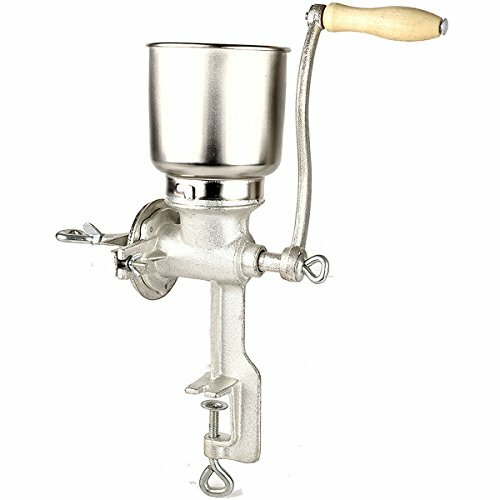 It has a large capacity hopper which can hold up to four and a half cups of grain, has an adjustable dial to set from coarse to fine, a sturdy stainless steel milling cone, and can attach a motor for automated milling (motor sold separately). This deluxe grain mill is a reputable option if you are looking for an easy to use hand-operated mill. Generally the reviews for the Victorio VKP1024 Deluxe Hand Operated Grain Mill are positive. Many users said they are very happy with the price compared to similar products. Some users reported that they had difficulty getting a fine grind, but others said that the user manual concisely covers this matter. A small minority claimed that they found metal bits in their grind after use. This 16 inch tall, manual cast iron grinder is a decent option that has a hardwood handle for easy operation. Its users like that it is very inexpensive, but also note that it is rather cheaply made. It has a manual grind, weighs around 8lb, metallic finish for preventing rust, and can grind up to 1lb of grain per minute. 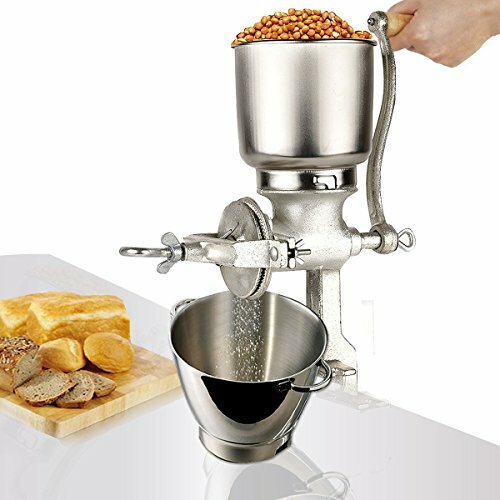 This corn & wheat grinder is a reasonable option if you are looking for a low-cost hand operated mill. Overall reviews for the Premium Quality Cast Iron Corn Grinder are rather mixed. Many users are pleased with its application on corn and nuts, but there are also many users who were displeased with its inability to grind fine flour. Some customers complained that the unit was heavy and difficult to set up, although easy to use once assembled. There are several reports of the hopper leaking and the grind getting all over the place while grinding. One user claimed to have found metal shards in their pinto beans after grinding. The large, rust-resistant manual corn grinder from Electric California is a sturdy option that has a long arm wooden handle. Its users are happy that it is very heavy duty, but also note that the cup can become slightly warped. Its cast iron construction allows for easy cleaning and its metallic finish prevents weathering, has a 5L hopper and a rubber pad underneath to stop it from scratching the working surface. This cast iron grinder is a solid option if you are looking for a reasonably priced manual grinder. Reviews for Electronic California’s Corn Wheat Grinder are rather positive. The majority of users experienced little problems with it. A few users found that it did not grind their grains finely, but this did not negatively impact their experience with the product very much. A small minority claimed that the product came with factory defects and repairs were required in order to have it operational. The 21 lb., FDA-approved, manual grain mill from Country Living is a quality option that comes with a lifetime warranty. Its users love that it is built to last, but also note that it is extremely bulky. It is made of cast aircraft aluminum, uses double sealed industrial-grade ball bearings, carbon steel grinding plates, has adjustable consistency from coarse to fine, a food grade powder coating, and is manufactured in the USA. This manual mill is a superb option if you are looking for a durable grain mill to last a lifetime. Overall reviews of the Country Living Hand Grain Mill are very positive. Users report that they are extremely pleased with the sturdiness and how heavy duty the product is, with most consumers stating that they have no concern about it breaking anytime in the foreseeable future. Users are also pleased with its ability to grind any material they put inside, with very good accuracy on the consistency of the grind. A small amount of users said that the unit was top heavy and had a tendency to fall over. One customer pointed out that the lifetime warranty is voided if modifications are made in order to automate the product. 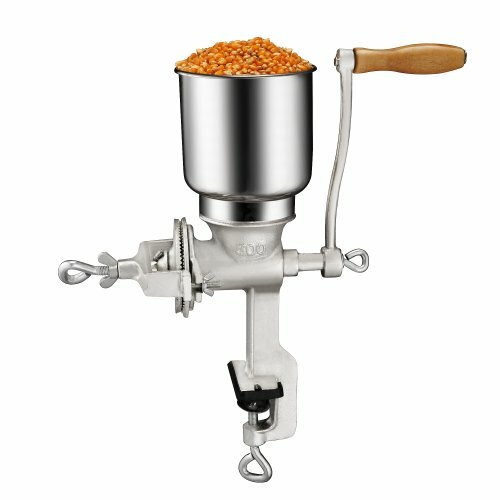 The long-lasting, easy to use Yosoo manual corn and wheat grinder is a well-made option that has adjustable burrs for consistency control. Its users like that it is great for grinding various different types of grain, but also note that the product does not always match the image advertised. It is around 8lb, has a rubber pad, is finished with electroplated tin to prevent rust, has a 5L hopper, wooden handle, and easy to crank long arm with a wooden handle. 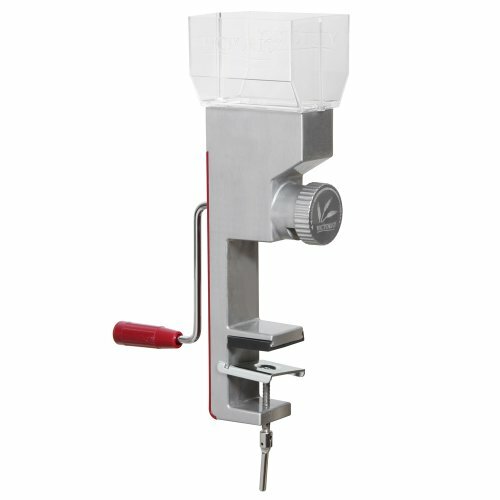 This hand mill is a solid option if you are looking for a durable hand operated grinder. User reviews for the Yosoo Cast Iron Hand Operated Corn Wheat Grinder are very positive. Customers have claimed the product works as specified however some have pointed out that the product inside the package does not look the same as the product depicted on the package. The company has corrected this issue by adding a disclaimer. Some users have described using their hand operated grain mills to grind up wheat berries and great northern beans to make their own flour- saying that they were looking for a grain mill that was affordable but that would also work if the power went out. Interestingly, with the Victorio grain mill, you can purchase an accessory that will convert it to an electric-powered grain mill, this was an option that some users took up. Another user describes how entertaining operating the grain mill is for children who apparently are fascinated by the process of flour creation. Another user describes using the Victorio- saying that the electric motor assembled pretty easily but that it doesn't actually go any faster than hand cranking, it's just a bit easier to do. 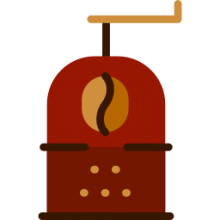 Indeed, purchasing the optional motor kits will make the grinding a bit easier, although many users describe sharing the hand cranking between family members to even out the burden of creating fresh flour. All of that said, purchasing a home grain mill is a great way to turn your wheatberries into homemade flour. It can save you a lot of money, while also ensuring that you get all the nutritional benefits of fresh and unprocessed flour- some users say that after around 72 hours of a wheatberry being processed and ground, it will have lost the majority of its nutrients, with the wheat germ having gone rancid. There are many different types of flour, including unbleached flour, bleach flour, plain flour, self-rising flour as well as enriched flour- there are even some specialty types of flour emerging on the market today that are gluten-free options. Wheat is the most typical base that is used to create flour though maize flour has been a Mesoamerican option that is frequently used, and the flour is often used as a ingredient in central Europe to make breads. If you are looking to make flour, which is most generally described as a type of powder created from grinding down different types of on cooked cereal grains for other types of groups or seeds, you will be interested in purchasing a grain mill. Using a hand-power grain mill, with the option to add an electric motor, is a great way to protect yourself during power outages, as well as involve the whole family in a fun and nutritional kitchen exercise.